Does the show convey a cut-and-dry subversion, or an exploitative reappropriation? Photograph by Catwalking for Getty Images. The irony of this “legitimatization” of the middle-class aesthetic is that it is prohibitively expensive to the middle-class—the classic fashion conundrum designers often face when they appropriate. Cost, exclusivity. It is the same as what Balenciaga did when they took the fifty-cent blue IKEA bag and priced it at two thousand dollars. Abloh, now collaborating with IKEA as well, is in fact doing the same thing. “My vision of this classic Ikea bag was like, 'Let me see this in another material,’ so I can gain another level of appreciation,” he said on-stage at the Fashion Tech Forum conference in Los Angeles. “Using my vocabulary can get a different emotion out of something that you've already seen.” But how many degrees of fashion mimesis can one take a paper bag before it turns from intriguing experiment to contrived device, like endless spin-offs of a blockbuster film? It’s a legitimate question, and one that, in a way, Abloh has actually done well to grapple with. That’s because Abloh’s seemingly infinite appropriations do in fact have a revolutionary potential. If he were to bring his own socioeconomic roots to his fashion without also fetishizing their class connotations, he might set up his thrift-store-looking designs for them to be admired for their utility, nostalgia, and authentic charm, at their fair price point. The fashion world, for instance, has embraced brands like Patagonia, without having to have it translated for them. Might Abloh be able to find a purer way to access his middle-class background than having to push it through fashion’s stultifying sieve? “I don’t want to be a celebrity designer,” he told W magazine last year. “I want to keep my personal life out of [my designs].” But he also told me, in an earlier interview, “I'm not looking towards a new demographic. I'm looking towards the demographic I came from.” His contradiction is telling: he teeters between wanting to absolve himself of his suburban, middle-class upbringing while holding fast to it as well. It cannot be understated the degree to which Abloh’s personal background informs his aesthetic. Ultimately, he wants to reappropriate his own upbringing—to choose it rather than have been dealt it. His trump card thus far has been to pretend as though he’s still a misfit in the fashion world—that he’s still in flux between the two worlds. I am “still crashing,” he says. “I don’t think that [my work] has been fully accepted.” But of course, his work has been accepted—and widely at that. While much of high-fashion, especially Abloh’s particular brand, is the result of an upward filtering of that which originates with non-elites—skateboard culture, graffiti, utilitarian work clothes, basic shopping bags—Abloh has chosen to define his core artistic talent as the ability to pull those aesthetics quickly upwards, while making few creative alterations. “If I take a men’s sweatshirt and write ‘woman’ on its back, that’s art,” he says. 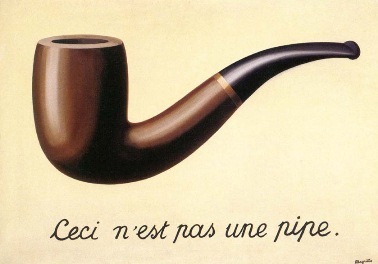 But it’s difficult to see the ideas of Magritte or Duchamp—which were last revolutionary almost a century ago—copy the idea and call it revolutionary now, just as you couldn’t paint a Cubist portrait of Dora Maar and say your “Picasso-inspired” artwork is revolutionary. Revolutions, after all, must be new. The show is nearly over. The models all now walk together as Tyler, The Creator’s “See You Again” plays. The models exit; Abloh comes out, and many in the audience begin to cheer. What has just passed is a blur of middle- and working-class clothing, the aesthetic and tenor of a milquetoast suburbia, supposedly challenged in the way of Bukowski, now being applauded by the fashion elite. It is dizzying enough for a sociology thesis, a paper that would necessarily include designers and brands from Gvasalia to Uggs to Louis Vuitton’s women’s trainers in its hefty footnotes. Photograph by Victor Virgile for Getty Images. He has used this claim to defend his high price-points, and it’s a defense used by many other contemporary fashion lines and designers who draw huge crowds via collaborations and various means of “filtering up.” It’s also the same logic that has, over the past decade, put a $110 Nike AirMax on the same spectrum of desirability as a $595 Manolo Blahnik pump. And yet this logic also threatens to stifle creativity: if enough people want something, that thing will be valorized. The quality, the originality, the art of it doesn’t matter—only its perception. Abloh is not mounting a defense of bottom-up fashion, of fashion-ified streetwear or middle-class malaise; he’s just explaining basic marketing and supply-and-demand economics. The show is over and you’re left wondering: how many different ways are there to say the same old thing?